On Today: Fill Out Census or You Won't Get Government Goodies! 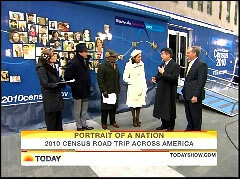 NBC's Today show invited on Commerce Secretary Gary Locke and Census Bureau Director Robert Groves to promote their Portrait of America road tour as a way to encourage people to fill out the Census forms or risk, as Locke warned, miss out on "$400 billion of federal funds," to which Matt Lauer underlined, "This is vitally important to communities." The entire Today cast braved 20 degree weather outside to stand alongside one of the vans set to tour the country to publicize the Census that, as the former Democratic Governor of Washington state alerted viewers, "will determine the allocation of federal funds to their communities for the next 10 years and could actually give them more political power in the United States Congress." AL ROKER: But first the U.S. Census Bureau is kicking off its Portrait of America road tour. And here to tell us about it is U.S. Secretary of Commerce Mr. Gary Locke and U.S. Census Bureau Director Dr. Robert Groves. Gentlemen thanks for joining us. GARY LOCKE: Thank you. Our pleasure. Good to see you. ROKER: So now over the next four months, your census workers are going to be going out in vehicles like these, and what's the goal of the trip? LOCKE: The goal of the trip is really to let people know that the Census is coming. We need everybody to when they receive their forms, to fill it out, only 10 questions, less than 10 minutes, and mail it back in. Because with that Census form, we'll determine the allocation of some almost $400 billion of federal funds every year that go out to cities, counties and states, based on the population. And in these tough economic times, when governments are cutting back, this is valuable money for schools, for education, for human services, for transportation. And the Census is used to determine how many members of the House of Representatives each state will get. And some states could gain a few seats, some states might lose, so it's very important that everybody be fully counted. LAUER: So you've just done a really good job of answering the next questions. You know lot of people hear Census, and they follow it with, *yawns* right? This is vitally important to communities and people living in those communities all across the country? LOCKE: It is very, very important. And this is really giving us a portrait of America. With only 10 questions, only 10 minutes to answer, this will determine the allocation of federal funds to their communities for the next 10 years and could actually give them more political power in the United States Congress. ANN CURRY: So how this is going to work is the Census, I understand Dr. Groves, is happening on March 2010, is that right? DR. ROBERT GROVES: The forms go out in March and we want you to return your form by April 1. CURRY: Okay so you don't have a lot of time. ROKER: What's the biggest misconception? GROVES: I think the biggest misconception about the Census is that it's boring and long. And it turns out this is the shortest Census in history. In our lifetimes. It takes every household just 10 minutes to fill out and it's really important. It's easy and I think the other thing to know for many of your audiences is that this is a safe thing to do. We have very strong laws that protect the confidentiality of this data. CURRY: No you go ahead. VIEIRA: No I just want to say, you'll each be driving one of these vehicles, right? GROVES: These vans are gonna drive about 150,000 miles over the next few months. They're gonna stop at 800 different events. They'll be at the Super Bowl. They'll be at March Madness, they'll be everywhere. And if you can't see the van yourself, where you can learn a lot about the Census, you can follow us on 2010Census.gov. We'll be tweeting, blogging, we'll be uploading Youtube videos. CURRY: So what I wanted to say is it's 20 degrees, and Dr. Groves really wanted to get this message out. He's out here without a coat. VIEIRA: And we want you to share what America looks like in your neighborhood and what would surprise people about the demographics in your community. So log on to todayshow.com to submit your photos and videos. And NBC News will pick submissions from your entries to highlight the changing face of America.